Unable to decide on a large project, and determined to make a serious dent in my stash, I have been working on several small crochet projects. 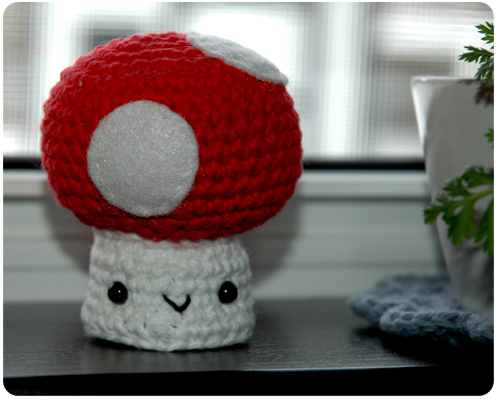 Today I present to you my smiling crochet mushroom. 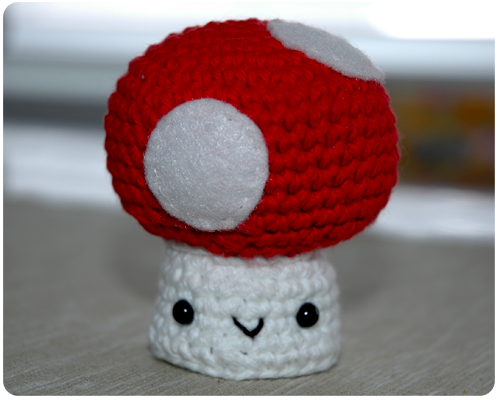 Yes, a mushroom. Don’t you have one? The pattern is from this book, which I was very happy to receive for Christmas. This little guy was fun to make, that is until it came time to sew the top and the bottom together. It was one of those tasks that should have taken no time at all, but my top kept going on crooked and my yarn ripped three times....so it became quite frustrating. But all is well that ends well, and my happy, smiling mushroom now sits on my kitchen window sill between my African violet and the unknown plant that Bridget gave me for Mother’s Day last year. Another cute addition to my ever growing fleet of crochet friends. They are so fun to make that I really can not stop.